The new iPad, priced at $329 ($299 with education discount), is largely unchanged from last year. Upgrades include the A10 Fusion processor that we last saw in the iPhone 7 and 7 Plus, and Apple Pencil support. The tablet is still lightweight, portable, and sports a 10-hour battery life. It feels quite speedy, with the only lag we noticed being processing text-to-speech for Live Titles in the Clips app. It clearly isn't as powerful as the iPad Pro, but it is an improvement over the previous A9 processor. We were a bit disappointed in the lack of updates to the camera; it is still the 8MP shooter we saw last year and is limited to 1080p video. One good thing about the camera is that it still doesn't protrude out the back, and instead remains flush against the aluminum chassis. Apple Pencil support is definitely a welcome improvement, though the Pencil itself retains a relatively high $99 price point. To fill in the gap, Apple introduced the $49 Logitech Crayon, a more affordable stylus suitable for educational institutions. Speaking of Apple Pencil, a major update to the iWork suite finally delivers support for Apple's stylus. In it, you can easily add drawings, animations, diagrams and more to your presentations, documents and spreadsheets. A new feature known as Smart Annotations is currently in beta and allows users to write on a document. Unlike similar PDF features, Smart Annotations move as your document moves. Outside of the new iPad and iWork changes, Clips and Garageband were also updated with a few small enhancements focusing primarily on education. For the best deal on 2018 iPad preorders, be sure to check out our iPad Price Guide. Several Apple authorized resellers will not collect sales tax in most states, potentially saving shoppers $25 to $45 compared to shopping at the Apple Store. I would definitely get it. I always felt the iPad Pro was a little pricey for me. So having Apple pencil support on the iPad is great. The fact that it doesn't shoot 4K is not an issue for me. I rarely use the ipad camera except for facetime. Maybe I am just old, but for me, the magic of Apple died with Steve. 1. I know Sammy’s Galaxy tablets are already dead, but I just want to recognize them: RIP Galxy tabs. 2. At this point, when the budget iPad packs all these features and performance while maintaining the price tag of $329, iPP pricing seems unreasonable and even a little ridiculous. At $649, it’s roughly 2x the price of the iPad 6th gen, and I just can’t justify that price gap. I hope this year’s iPP would bring enough enhancements to make me feel I was actually wrong. After trying to compete hard with iPad and just like Apple Watch, Android tablets dropped out of the race and no Android tablet is even close to iPad at this price/performance anymore. Apple is really a single player in this field, just like Apple Watch. Yep must be. Nostalgia is a helluva drug. Very excited to test out the new e-book creation capabilities on the iPad. Pretty sure that the Google Chromebook Tab 10 from ACER (Note: in previous posts, I stated incorrectly Asus) is acknowledgement that Android OS Tablets are very, very, dead. I thought I heard during the presentation something about multiple students being able to sign onto a single iPad. Was that for school only (where they're accessing a school app) -- or does it mean a multi-user iPad where each member of the family could use it? Not impressed. A more recent CPU, but not the latest. Still has bluetooth 4.2. How much RAM? Apple Pencil and keyboard from Apple still very expensive. And no pointer support. So the only main difference is Apple Pencil support (CPU upgrade is a given). And how about a redesign to make it more rugged for schools? I expect more from this highly profitable company. To be fair on the iPad Pro pricing, those devices are now a bit older. Chances are they will be updated fairly soon, putting them quite a step above this budget iPad. The more egregious issue, in my opinion, is the ridiculous price of the iPad Mini. The mini 4 is only $29 less than the same storage 9.7"iPad. So for that $29 you get a bigger/better screen, faster processor, upgraded motion coprocessor, more ram, etc. The iPad Mini isn't even capable of shooting Live Photos. So is the Apple Pencil no longer considered a “Pro” feature? 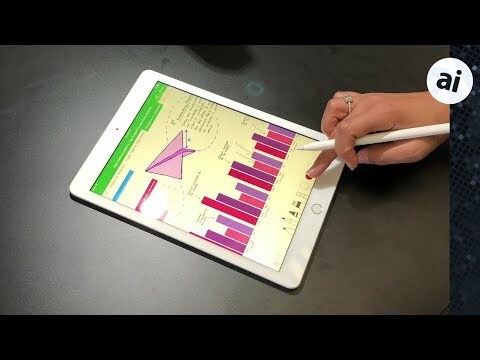 Or will the next iPad Pro support a new version of the pencil that this iPad won’t? What I see at this point is my stock dropped to day. Mr Market did not like what Apple did; so, people sold the stock. There has to be something else. But wait there is more. I would expect no less than what Apple did today. It is 1+ year old parts with a long over due software update. There had better be more pretty soon for the higher end. Apple can do better. They are over confident - I wonder if the original talent and drive has some been lost. They have to move fast because everyone wants a piece of their cheese. They cannot tell us what they are doing - they must show it. I don't care for the competing products, but they have not left the scene yet. I like the new 9.7" iPad and am glad to see it get pencil support. I wish it had a laminated display though as it's noticeably thicker (and heavier) than my current iPad Air 2. I'd take that trade off for additional battery life, but it's clear they started making them thicker again as an up-sell to the iPad Pro line. For that I might as well stick with my Air 2. The Pros seem outrageously priced at this point particularly in international markets. Sure you get a better display, but I'm not sure it's a case of twice the experience for twice the price. I like the idea of the Apple pencil, but it's much too long. Two thirds of its current length would feel so much better in the hand. If you can top up the charge by plugging it in for a minute the battery life is more or less moot. "A new feature known as Smart Annotations is currently in beta and allows users to write on a document. Unlike similar PDF features, Smart Annotations move as your document moves." I am not understanding that at all. I can write on PDF files on iPad Pro (IBook and GoodNotes) and the annotations will also be updated as well. If you think Apple's stock performance has anything to do with announcements you haven't been following them long enough. Even when they announced the 6 and it sold 80M, the stock was still at a ridiculously low PE. There is no logic to the Apple stock performance and Apple should certainly completely disregard it when doing their strategic decisions. Hence the proliferation of two in ones and touchscreen laptops. Find the gap in the market. Thing is, the touchscreen on my HP is absolute rubbish. Maybe because it is still win7. That said it isn’t noticeably better on my son’s Spectre running win10. Will the students be able to stick their Apple Pencils into the ceiling tiles? FoggyHill: I have Followed Apple and owned the stock & products since before 1984. Apple has already sold the stock that we now own. Wall Street moves stock up and down, not Apple - except Mr Market expects more and Apple can deliver more. It is my largest single holding, but I expect more from Apple. The Marketing Effort has been off for a long time. I do remember when they could not afford to buy parts to build the products - now they cannot get enough of the parts. The A series chip is a wonder to behold. Apple has all the cash, but . . . Interesting theory that Apple stock dropped a few bucks today because “Mr. Market” didn’t like the Apple event. Maybe you also also know why Google dropped almost $50 per share today?